Eddie Jones stated that England rugby union lack world class players despite their stupendous success in 2016 which saw them complete 13 consecutive wins. 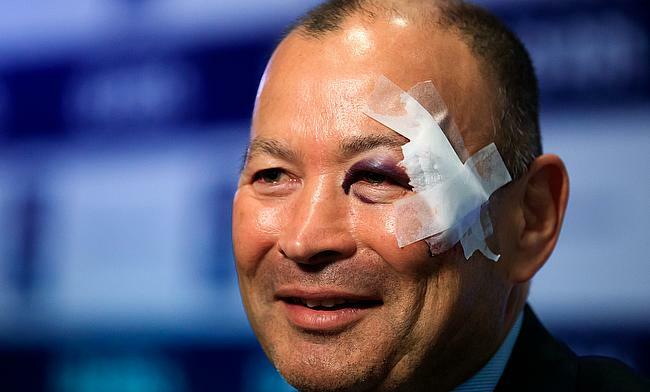 The 56-year-old was seen sporting a nasty eye injury and a cut during the launch of the Six Nations 2017 tournament in south London along with captain Dylan Hartley. The England boss later revealed that the injury was a result of a fall out in his hotel bathroom. Ever since Jones took over following the World Cup debacle, England clinched the Grand Slam for the first time in 13 years, registered a series whitewash against Australia for the first time and remained undefeated in their autumn internationals which saw them climb to the second position in World Rugby rankings behind All Blacks. “I think the term world class is used lightly. To be world class, you’ve got to be an automatic selection in a world XV. We don’t have any of those players. Jones further added that he was pleased with the efforts the players had put during the two-day training camp in Portugal. Even though, their preparations were hampered by injuries to key players, the former Wallabies coach is optimistic about his team's chances. “The players’ attitudes have been first class, we’ve got a lot done” said Jones. “We’ve got a few injuries but we’ll cope with those injuries and get on with it. “It’s a great opportunity for us to increase the depth of the squad and keep moving forward. If you want to be the best team in the world, you’ve got to have depth in your squad." England will kick start their Six Nations campaign against France at Twickenham on 4th February.